Business Attitude: Advertising: That Works - That Does Not Work - Case 1: Our Restaurant is Empty on Tuesday Nights. Advertising: That Works - That Does Not Work - Case 1: Our Restaurant is Empty on Tuesday Nights. There are as many reasons why advertising works as there are why it does not work. Each article will contain one case; welcome to Case One. You own a restaurant; it is busy on Thursday, Friday and Saturday nights. Objective: Create a larger Tuesday and Wednesday crowd. 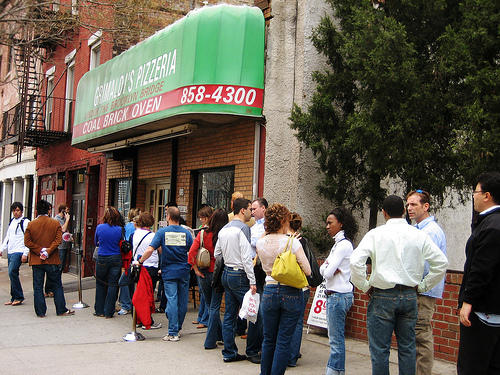 waits in line for their Pizza. Suggested Approach: Your first thought may be to promote specials, immediate seating, or no-reservations-necessary in your advertising for the slack times. This type of ad says to me "Hey come buy something no one wants - no line to wait in". A better alternative would be to create more demand during your busy time creating lines at the door - making your restaurant a destination. People that finally get seated learn how good your restaurant is and thus visit it more frequently (ie: Tuesday and Wednesdays). People that are either impatient or won't stand in line in the first place are curious to the mystique of what is so special about that place; they stop at the first opportunity of no line. The moral here is that Good Advertising does not sell bad product or product no one else wants. I remember when many restaurants were closed on Monday or Tuesday because business was slow on those days. Now, they have to be open just about every day to pay the bills.